The Low-Loader is the lowest load angle rollback carrier on the market. It’s innovative design using a forklift platform transforms the load capacity and angle capability of the bed. The Low-Loader is designed for an extremely long service life for all major components. Maintenance costs for the LowLoader over a 10 year period is drastically lower than other standard duty carriers on the market. Detroit Wrecker Sales custom designs each Low-Loader package to suit our customer’s professional towing needs, helping them get exactly the right Low-Loader for the job. From raw steel to raw towing power, the strength, quality and craftsmenship that goes into our build process is unmatched, you can’t get a better built product in the towing industry. Detroit Wrecker Sales is a family owned and run company located in Detroit, MI, U.S.A. We are very proud to employee workers and build our products right here in Detroit, Michigan. Winch Hose Pulley System – This system offers easy access to change, replace, or service in less than an hour. Hoses run on individual pulleys. This feature greatly extends the life of the hose. Stationary Light Bar Pylon/Hydraulic Reservoir – Our Pylon is also our Hydraulic Tank. It’s not hidden under the bed. You can always add oil to the system, no matter where the bed is positioned. Bed Wear Pad System – Our Wear Pads have an estimated life of 10,000 plus cycles and do not require re­moving the bed. R&R the pads in 1 hr. One Piece Control Handles – Lifetime Warranty – Eliminates all linkage between Control Handles. 1 Rod for each function, from the Driver Side to the Passenger Side. All Pins & Bushings – Lifetime Warranty – Every Cylinder Pivot Point has a Bronze Oil-Lite Bushing which protects the pin for years of use. Dumping Angle – 40 degrees clearly the highest in the industry. Work faster by dumping the junk car quickly. Bed Lock Free Design – Our bed is always locked to the frame. You do not have to slide the bed into bed locks.You can slide it away from the cab to accomodate your longer or larger load. With a truly independent Wheel Lift mounted to the Truck’s Frame. There are no bed locks needed to keep the sub-frame from tilting. Cylinders made in house – Our cylinders use superior seals & components. Detroit Wrecker offers a 4 year warranty on cylinder seals. 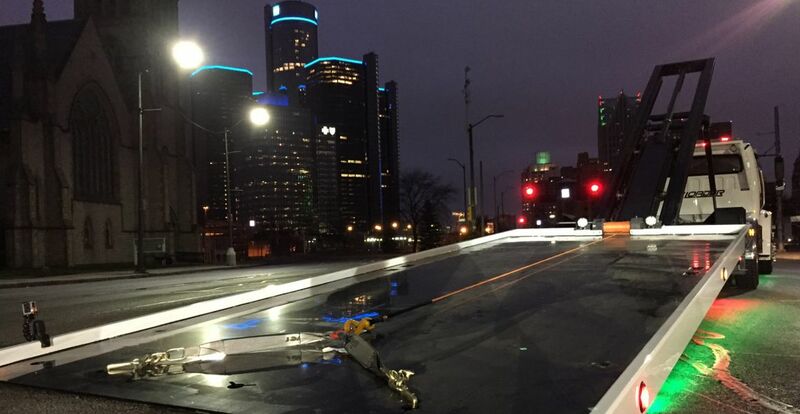 Our goal is simply, build a Roll Back for the conditions operators face daily & make it Detroit Wrecker Tough! Watch The Video Below To See How The Low Loader Works. 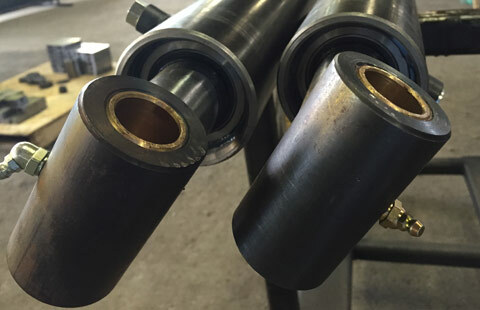 We implement bronze Oil-Lite bushings on ever pivoting cylinder, this creates little to no maintenance for the end user. Detroit Wrecker Pins & Bushings are backed by a Lifetime warranty. The Lowest Loading angle in the towing industry – period. 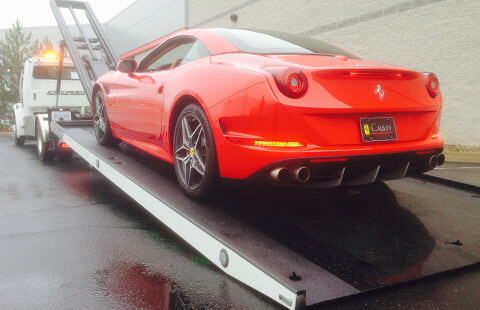 Allows you to load the high-end sports cars, quick and worry free. Separate yourself from the competion with the roll back that does it all. 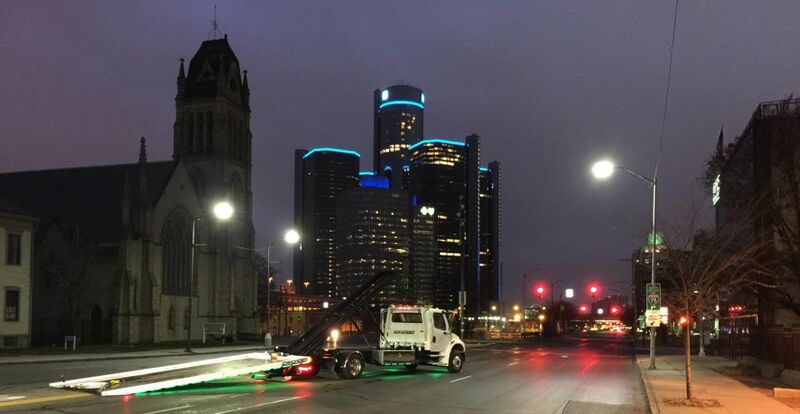 Detroit Wrecker performs installation of Low Loader and includes black powdercoating. We can produce any color of power coating at no extra charge. Low Loader standard length is 18 feet long by 100 inches wide, with optional lengths of 19 feet, 21 feet, 24 feet, 26 feet & 28 feet with up to 102 inches wide. Includes Ramsey 8000 pound Worm Gear Winch with 34:1 ratio. 75 foot winch cable with swivel hook. Wheel Lift up to 5,000 pound lift capacity, and 10,000 pound tow capacity. Lowest Load Angle Highest Dumping Angle. Low Loading is optional. Any loading angle is allowed. 8 inch on center for cross members on deck. 3/16 inch smooth steel deck with 3/8 inch tail plate. Add Diamond Plate for only $1,200. All hydraulic hoses are Parker “Tough Cover” Part# 451TC. L.E.D. light bar Whelen Justice 10 L.E.D. head. L.E.D. light package on equipment, Lifetime Warranty by TecNiq, Inc.
PTO Muncie Hotshift. Clutch pump are optional. Includes V-Chain of your choice. Includes a pair of Grade 70, 6 foot J-Hooks. Includes ratchets and straps for wheel lift. Includes a 36 inch tool box with stainless steel doors. 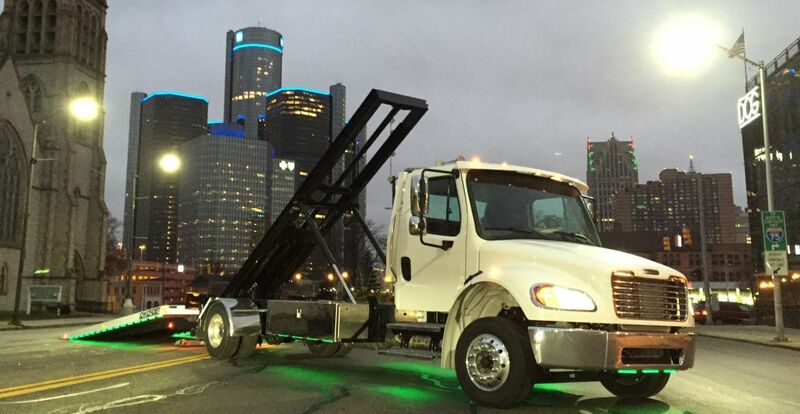 Call Detroit Wrecker Sales to purchase a new Low-Loader and we can discuss everything from specifications, the design, special features, payment and financing options, as well as delivery dates. Ready to be a proud new owner of a Low-Loader by Detroit Wrecker Sales? Click the link below to purchase a Low-Loader from our online store, or give a call and we can get started over the phone! If you need financing for your next wrecker, Low-Loader or Little Herc, be sure to check out the guys at Lease Station, previous customers have secured loans through them. With over 20 Years of experience in building and servicing tow trucks and flat bed wreckers, our technicians and master fabricators can handle any of your towing repair, upgrade and custom manufacturing needs. We sell, service and install the best products the towing industry has to offer, including many of our own ground breaking products. If they don’t make it, we can custom build and fabricate anything you need. Few companies can make this claim. Buy from the experts who actually build and service tow trucks and flat beds for a living. Experts who know the best options to meet and exceed your needs, all while offering you the best prices in the industry. We stand on top of our work!